WORLD'S BEST HAZELNUTS - Turkey dominates the world hazelnut industry, producing 75% of the best & nuttiest varieties in the world. Taste the difference with SincerelyNuts raw redskin hazelnuts! RICH IN VITAMINS & MINERALS - This nutty snack is not only delicious - it's fantastic for your health! Loaded with Calcium, Copper, Iron, Zinc, Magnesium, Phosphorous and Vitamins A, B6, C, E and K.
PLANT BASED PROTEIN - Each serving is packed with 5 grams of plant-based protein, making them a healthy well balanced nut. 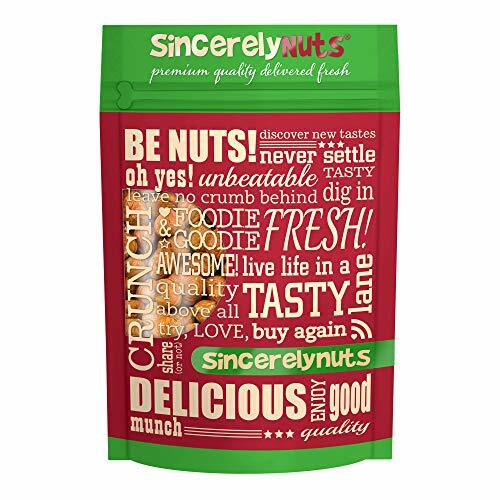 They're also one of mother nature's highest sources of folate and Vitamin E.
UNRIVALED SOURCING QUALITY - At SincerelyNuts we are committed to the highest quality hazelnuts, sourced from premium farms and fertile, nutrient-rich soils near the Black Sea in Turkey. CERTIFIED KOSHER - Our kosher nuts & snack foods are second to none in the Amazon marketplace. Enjoy this vegan & gluten-free delight absolutely guilt-free - ethically cultivated and processed. If you have any questions about this product by Sincerely Nuts, contact us by completing and submitting the form below. If you are looking for a specif part number, please include it with your message.